now on sale in North America. Harrodsburg, Kentucky, November 13, 2013 --- Hitachi Automotive Systems Americas, Inc. - the regional headquarters for the Americas within the global operations of Hitachi Automotive Systems, Ltd. - today announced that it is supplying lithium-ion battery pack for the 2014 Nissan Pathfinder Hybrid sport utility vehicle now on sale in North America. The lithium-ion battery packs for the Pathfinder Hybrid are compact, lightweight units offering high power density capability. 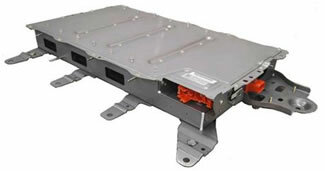 The battery cells are being manufactured by Hitachi Vehicle Energy, Ltd., a Hitachi Automotive Systems Group company, for assembly into the battery packs at Hitachi Automotive Systems Americas' Kentucky plant. With environmental regulations being strengthened globally and automotive technology aiming to achieve greater sustainability, hybrid and electric drive vehicles are expected to become increasingly widespread to utilize energy that is clean as well as reproducible and sustainable. In 1999, Hitachi launched its vehicle battery business, as the world's first mass producer of safe, high-performance, long-operating-life lithium-ion batteries. It has since supplied the market with more than 4.5 million cells for commercial hybrid buses and trucks and hybrid passenger vehicles. Hitachi Automotive Systems Group is pushing forward with the development of electric vehicle battery systems, expansion of sales, and other efforts for meeting the current and future needs of customers worldwide. Hitachi Automotive Systems Americas, Inc., a subsidiary of Hitachi America, Ltd., manufactures, remanufactures and markets a wide range of automotive systems including engine management systems, electric power train systems, drive control systems and car information systems for all major automotive original equipment manufacturers and aftermarket customers worldwide, providing leadership within the global operations of Hitachi Automotive Systems, Ltd. as the regional headquarters in the Americas. The company is headquartered in Harrodsburg, KY.
Hitachi America, Ltd. headquartered in Tarrytown, New York, a subsidiary of Hitachi, Ltd., and its subsidiary companies offer a broad range of electronics, power and industrial equipment and services, automotive products and consumer electronics with operations throughout the Americas. For more information, visit www.hitachi-america.us. For more information on other Hitachi Group companies in the United States, please visit www.hitachi.us. Hitachi Vehicle Energy, Ltd. is a subsidiary of Hitachi, Ltd., headquartered in Ibaraki Prefecture, Japan. The company is developing state-of-the-art battery technology focused on lithium-ion battery technology for automotive application and expanding the scale of the mass production by strongly cooperating with Hitachi Automotive Systems, Ltd.
For more information, please visit the company's website at http://www.hitachi-ve.co.jp/en/.